OK, confession time. I had not previously heard of Starlight Brigade until I listened to some samples from this new album and I was intrigued. Starlight Brigade come from Sweden and appear to be the musical vision of Anders Nilsson, the principle composer and producer, with several other musicians. Their first album, Under The Velvet Sky, was released in 2013, this was followed by Into The Light and now this year the third album, Destination Eternity. They state that their music has echoes of the ’70s with influences from the likes of Pink Floyd, Led Zeppelin and The Beatles, and while you can hear these in the music, to my ears there are other influences to be heard, but more of that later. 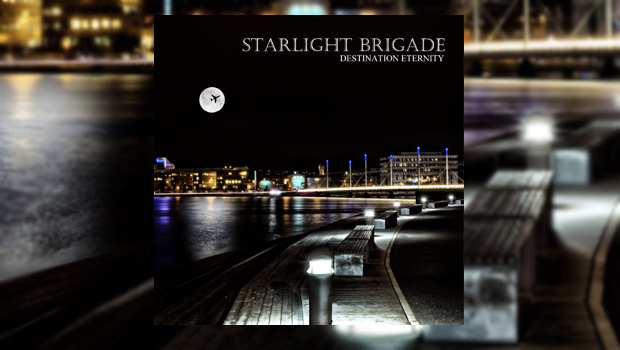 It often appears that bands from Scandinavian countries have a way of make interesting and melodic music, sometimes dark in tone, and Starlight Brigade certainly provide us with the first two, but there is nothing dark about their music. There appears to be a bright and positive feel to their songs, with lush textures and great vocal harmonies throughout. The album kicks off with Across the Milky Way; the song starts with a Pink Floyd feel to the keyboards and guitar, but as the song develops and the drums come in it has what sounds like an Ayreon influence (but without the heavy riffing). I also feel there are touches of Magnum here also, the keyboards creating the atmosphere for the song, supported by a great vocal and a very good guitar solo towards the end. There are excellent performances throughout the album, some lovely vocal harmonies and fine guitar and keyboards all supported by solid drums and bass, saxophone and flute making appearances on some tracks. The lead vocal duties are divided between the three main vocalists, with Peter Sundell handling the bulk of the tracks, Peter Hjalmarsson four tracks and Micael Lilja three. This works well as they have chosen the best voice to convey the right feel for each song. Track three, A Toss of the Dice, has a bluesy guitar and feel, at times almost drifting into blues/pop if there is such a thing, again with great harmonies and guitar. The Pink Floyd influences are most notable on Fading Star v2.0, here the vocal delivery and musical structure are reminiscent of their Echoes era, but that is where the similarity ends and Starlight Brigade have used their influences to create their own sound here, one of my favourite songs on the album. The Final Sign gives us a song in the American rock style, before the keyboards come in and the direction changes. An excellent guitar solo drags us back towards a more Floydian feel before the song ends as it began. Across the fifteen tracks, what stands out is the consistency of the song writing and the band’s performance in delivering them. This is an album that would fall on the more melodic, lighter side of progressive rock; it delivers more on repeated listens, indeed the Beatles influence is shown in the pop/rock structure of some songs. This is not a bad thing and, as stated earlier, they have used all of the influences to craft their own sound. Starlight Brigade has been an interesting discovery for me and if the elements I have mentioned appeal to you, this could well be an album worth investigating.